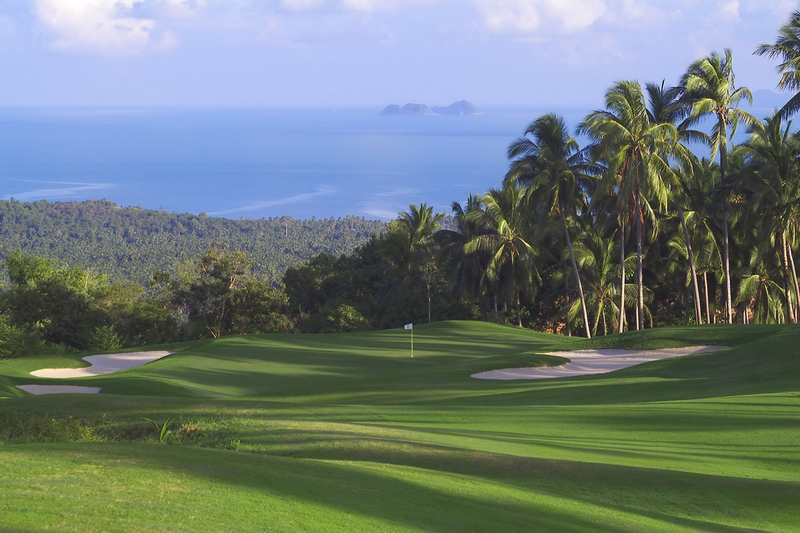 Thailand golf vacation holiday packages including koh samui golf courses, Koh Samui Hotels,Samui golfing holidays in Thailand. 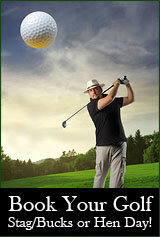 Golf travel guide, tours in Koh Samui Thailand. 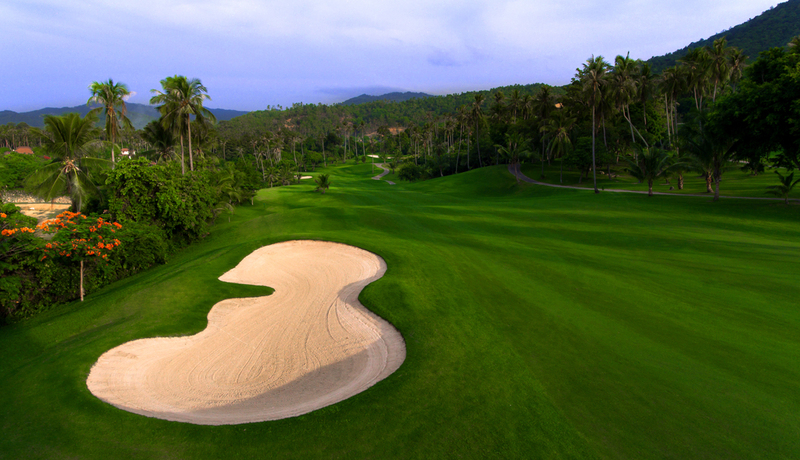 Koh Samui is Host to two of the most unique courses in Thailand. 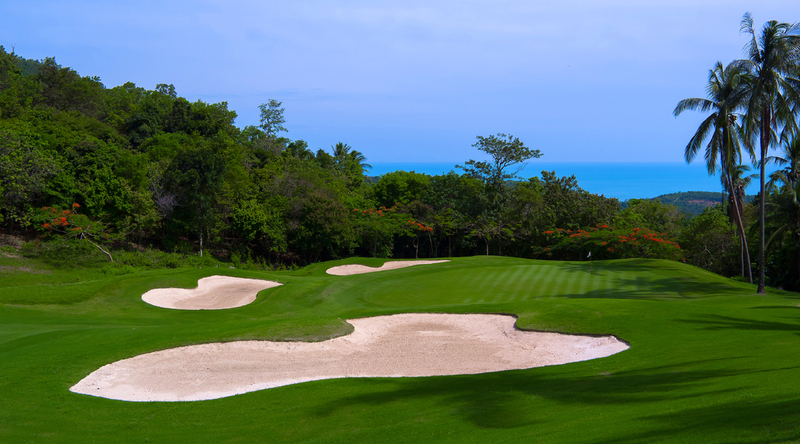 Breathtaking views of surrounding coastline make this a golfers paradise. Once you have emailed us with your golf arrangements click on our Samui Villa's banner and choose from over 30 villa's we have to offer in Koh Samui. In today's competitive business environment corporate entertainment is playing a more important roll in customer & business colleague relationships, a Corporate Golf Tournament at Santiburi Samui Country Club is the ideal way to enhance your company or brand profile and to entertain your valued customers in a relaxed atmosphere. Corporate golf tournaments promotes synergy with business colleagues and clients alike, your own corporate golf tournament will encourage camaraderie and cement relationships within the work place and valued customers. 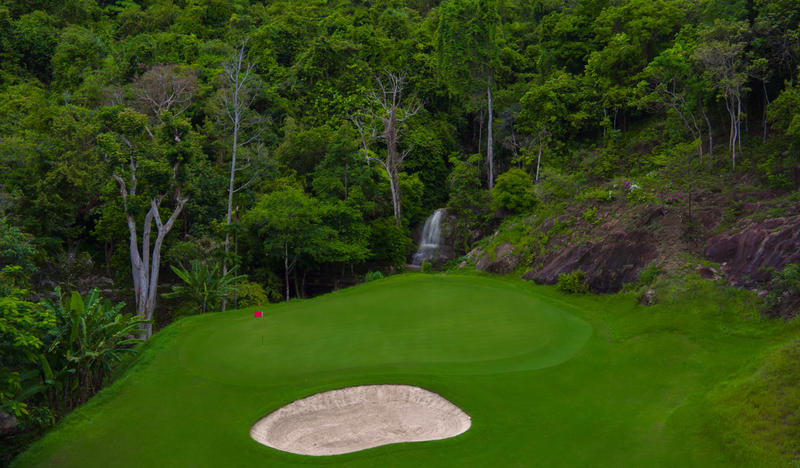 Designed by Pirapon Namatra and co-designer Edward Thiele, Santiburi is the only18 hole golf course on Koh Samui, but what an incredible experience! A great design is combined with top-quality grasses and manicured professionaly to create a memorable days golf. It is extremely tough and demanding as during your round you are continuously playing uphill, downhill and sidehill lies, not easy for any golfers standard. Carts are mandatory and absolutely necessary as this course takes you 280 metres above sea offering fantastic ocean views. 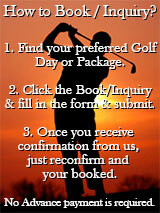 Example: Corporate Golf Tournament Itinerary & Cost. 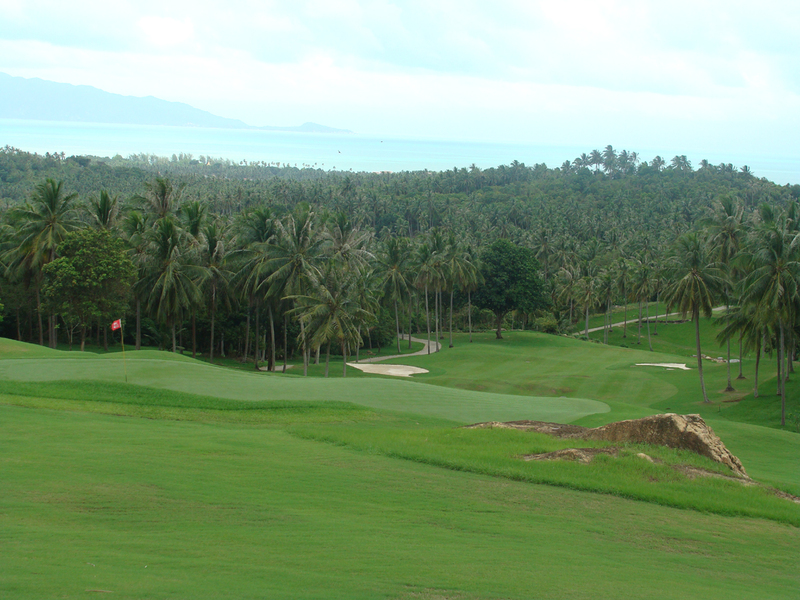 Golf Course: Santiburi Samui Country Club. Tournament registration in the Santiburi clubhouse. Showers golf course or return to hotel. 18.30 Prize presentation golf course. Standard Bar Singha beer - Red & White Wine, Whisky, Gin, Vodka, Local Beer and Soft Drinks (optional). *Or Dinner by selected Hotel Pool & Presentation Awards Ceremony. Includes: Driving Range Balls, transfers,Green Fees, Caddy Fees, Golf Cart (1 golfer per cart) Pre-Golf reception, Pre-Dinner reception (including free bar one hour) Presentation Dinner and Golf Trophies. *Additional non-golfers: Receptions and Dinner Bt 1,800. Tournament Format: Advice on the format of the Corporate Golf Day will be given to suit your requirements depending on the ability of the golfers and the numbers involved. The tournament will be played to the stableford format, allowing players to maintain a genuine interest in the tournament even if they have returned a bad score at any given hole. To encourage team spirit I recommend that a team prize should be awarded to the group playing together who have the lowest net score over the 18 holes played, this will be based on the best ball net score recorded at each hole with full handicaps. Team Prize: golf trophy for the four team members. Nearest the pin / Longest Drive: trophies.or gifts. Scorecards can be prepared prior to your event stating the players names and their relevant handicap provided by the the client one week prior to the event, also advising us of player groupings and teams 1-7 (Front Nine) and 6-13 (Back Nine). We can even help arrange a range of banners with your event logos to help better brand your Corporate Golf Day. ( Restrictions Apply). Nearest the Pin: On a pre-determined par 3 an added incentive competition will be held to see which golfer from the group achieves the closest shot to the pin flag. Scoring pins and banners can be provided. Longest Drive: On a pre-determined par 4 or 5 an added incentive competition will be held to see which golfer from the group has the longest drive off the tee. Again scoring pins and banners can be provided. Tournament Desk: We can set up a Tournament Registration Desk to register your golfers and provide any corporate gifts or information that needs to be distributed. We will provide a tournament document that will be given to all players on arrival at the course, this document will advise of the tournament format and rules, the players tee off times, playing partners and the hole at which his group will start. The document will also advise of the holes for the Nearest the Pin and Longest Drive prize holes and local rules. Scoring: We are also able to provide scoring for your corporate event using formats such as Stroke Play, Stableford, Texas Scramble, Better Ball and many others. All results will then be compiled and delivered ready for the prize giving ceremony. Golf Clinics: To enhance your guests experience, we have professional coaches who can tailor design a corporate golf clinic to best suit your needs. Options include either a 30-minute pre game exhibition clinic, or hands on 2-hour beginners class for the non-golfers in the group. Golf clinics can add the perfect touch. Food and Beverage: We can organise a light breakfast or lunch depending on the tee time. Sandwiches and a bottle of water can be given to the players on the course or a full buffet meal at the end of your round at the Santiburi golf course restaurant. Other options for evening dining locations are available to suit all sizes of corporate events. This golf tournament proposal quotation and itinerary is prepared purely as guide to running a successful corporate golf tournament, Santiburi Samui Country Club is the only 18 hole golf course on Koh Samui of international standard. We have only given you possible options for the running of your golf tournament you the client have the choice to pick what kind of tournament your company or group want to run. Choose your budget - Choose the tournament format - Choose the pre-golf entertainment - Choose the presentation awards dinner menu - Choose the prizes. 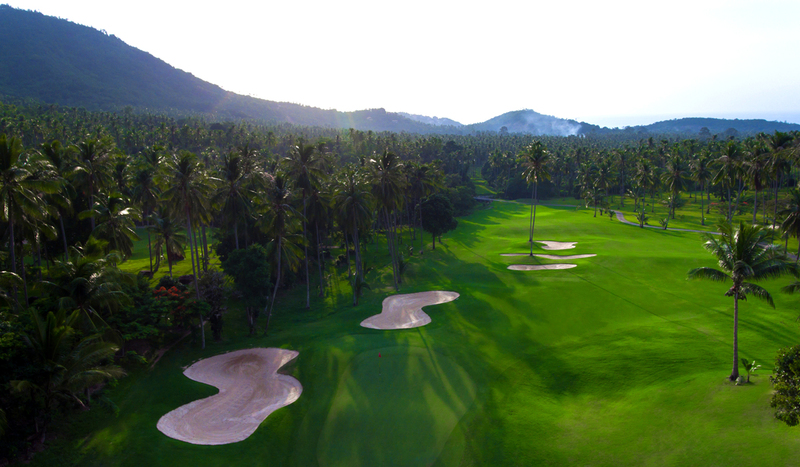 Information: If you are interested in hosting a Corporate Golf Day or any other golfing event at Santiburi Samui Country Club then please feel free to email our Sales team at golf at info@samuigolf.net.